Culatra has a shallow lagoon where low draft boats come to rest or, in many cases, to rot. The place has become a community of eccentric transients. But in this case the owners are the transients, not the boats that mostly stay here year-round baking in the hot sun. There's a sort of community club (shown in the center below) and the most amazing art exhibit that, along with the old Danish artist, has been featured in many magazine articles. Two years ago I had a long talk with him and he confided that newcomers were polluting the place with stress. "First it was a satellite dish, a generator and a TV, now it's WiFi. Then they get all stressed because these things don't work properly or break down. People create stress for themselves," he said ruefully. He also showed me his pet octopus he kept in a cage in the water. I remember thinking that keeping an octopus caged didn't fit with his character. This year I was on a kayak and didn't go ashore, but from the look of his studio shack (as shown further down) overflowing with art pieces hanging on the wall it's evident that he's still here. I tend to see these "sailors/campers" as the disciples of Henry David Thoreau. But I may be wrong because I met one Italian owner of a Warren-design catamaran and he is a psychiatrist who visits his beached boat on and off. Actually it's for sale. And what's even more amazing, he built most of it in Peniche by himself. Ain't this world full of characters, or what? This "sailor" even has a lawn. Now, this is weird. We had houseboats, now we also have landboats. My cheap camera and photographic skills don't do this place justice - believe me this is another world and people are living another life here. This guy got stuck in the middle of Walden Pond. He definitively doesn't need a Rocna anchor. The old Danish artist who has lived here for many years arrived in his incredibly unique boat (on the right with a blue tarp) and spends much of his time creating art pieces as seen in his "studio" in the middle. Notice the gaping hole in the leaning boat. This is a local shack near the entrance. My new fuel-efficient recreational vehicle. 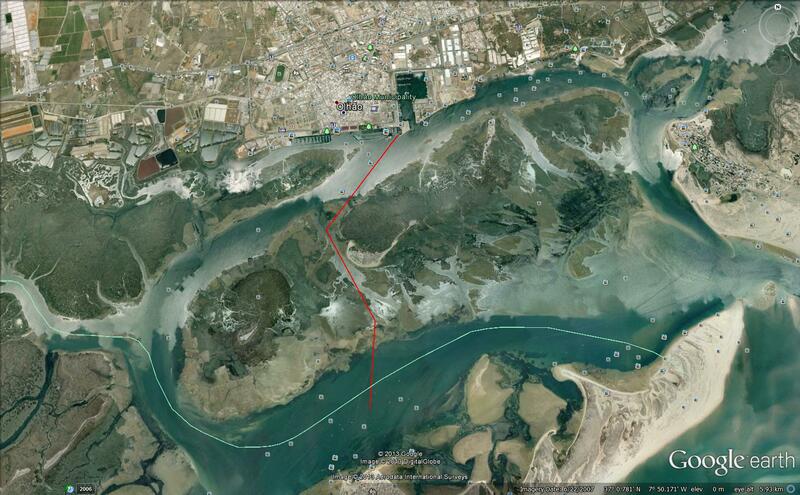 After driving 350 km, I reached the port of Olhão at 2 pm. It was a hot day. A "parking guy" pointed me into a vacant spot near the marina. I tipped him one euro. He smiled and reminded me to hide the GPS. When I began pulling the Bic Bilbao on its rear wheel over the rough pavement, it made a loud rumbling noise which, naturally attracted another "parking guy" who invited himself to pick up the other (heavy) end. When I told him it was not necessary, he replied cheerfully: "Amigo, I have nothing to do except help people, that's all I have in life." Those words cut into me like a knife. Here I was about to paddle out to my anchored sailboat and this poorly dressed unshaven guy was hustling tourists to survive. He was not a drug addict working for his next fix - no, he was just another unemployed young man struggling to make it through life the best way he could or knew. When we finally reached the ramp under the blazing sun, I turned around and saw him all sweaty and out of breath, but still smiling. "Have a good trip," he said cheerfully and began to turn around. "Wait," I interrupted, "thanks for your help...have a cold beer on me." I was ready to give him a fiver but realized that my wallet was already packed in the bag. I only had 1.50 euros in change in my pocket, which I gave him with an apology. He smiled, "I was just helping you amigo." The kayak route. This Google Earth shot was taken during a very low tide showing normally submerged sand banks. This is roughly the same route the water taxi took, as explained in my last post. It took me about 45 minutes to travel nearly 3.5 km. In reality I must have paddled at least 5 kilometers - somehow I kept going way off course. I think it was the tide. Jakatar was exactly as I had left it. It was tricky standing on the boarding ladder, holding on with one hand and trying to untie all the knots holding down my waterproof bag with the other hand. Attaching a line to the kayak's front handle with a bowline knot was impossible using only one hand. I got back on the kayak, leaned forward on the the skinny bow with line in hand and quickly found myself in the water as the kayak rolled over. Performed that stunt three times because I can be stubborn or stupid - you decide. At least I practiced rolling the kayak over and getting back on, just like I'd watched on Youtube. Finally got smart, jumped in the water and tied the damn knot using both hands. There, problem solved. I still felt like an idiot, though. Main street, Culatra. That's not Ana, and I swear she just happened to walk by, really. Follow this "road" all the way to the ocean-side beach. My favorite restaurant, people-watching hangout, café, bar and free bathroom. If I pick the right table I can also keep an eye on Jakatar. Funny how I was away from the boat for 2 weeks or so and didn't lose a minute's sleep over it. When I'm there, I keep an eye out for other boats anchoring too close and so on. Is this nutty or what? Alvor is where you hang your sailor's hat, for a while anyway. It has a lagoon, an endless pristine beach and a really long - I mean really long - boardwalk built on stilts over the sand dunes. Although it's 3 miles from Lagos and about 8 from Portimão (both with large modern marinas), highbrow boat owners tend to stay away because of the complicated entrance channel and because it's not posh. Let me give it to you straight - the Alvor anchorage is populated mostly by cruising boats with experienced anchors. In town, the narrow hillside streets are lined with bars, restaurants and the usual tourist flytraps (sort of forgot to take pictures). The town is rather peaceful during the day and jam-packed at night, mostly with gringos from the United Kingdom. Maybe I shouldn't say this publicly, but I can't help notice that the Saxonic ladies have a thing about painted lips, low tops and tight skirts. On the other hand, I might be suffering from a solo sailor's ailment called "visual scurvy." Best of all, Alvor has two dinghy docks and the water is flat calm - perfect for sleeping after a few drinks in town. Worst of all, the water is murky at low tide and there's no source of fresh water. There used to be a very convenient tap near the old fish market near the lifeboat house, but it was eliminated a few years ago. Traditional boat taking tourists on a daysail. The town has a small fishing fleet, and rows of wooden houses where the fishermen keep their hardware and take naps. Headed for Culatra motoring along the "Faro Ria," a large shallow body of water enclosed by a huge sand dune running parallel to the coast. The sailboat leaning over in the background no longer floats, only it's deck is visible at high tide. The village of Culatra in the background. I anchored at a distance to reduce the odds of a close encounter while I'm away. The ferry to the city of Olhão. The crowd about to get off will make a bee-line to the beach through the traffic-less town of mostly tiny houses build on sand and with streets the width of sidewalks. Went to Olhão to check out the express bus station - good thing I did. Even after asking three locals, it took me forever to find it on a side street in the middle of town. This is the last I saw of Jakatar. I hope it's still there. The afternoon before I left, I made arrangements with a taxi boat in Culatra to pick me up at the boat at 9 sharp. I described Jakatar, its position and name. "It has Peniche written on the hull," I told him. Everybody in Portugal knows Peniche, not to mention that I was the only boat from Peniche. At 5 to 9 I'm all locked up and standing in the cockpit waiting when I see a taxi boat slowly meandering through the anchorage and finally roaring off toward Olhão. I pulled out his business card and started dialing, got the number wrong (I don't have a smartphone and the keyboard is tiny), then got it wrong again and was just starting to swear when I heard a voice. "Bom dia." I had been looking at the wrong boat and the right one had coasted silently up to me behind my back. Boat taxis normally blast through the anchorage like madmen. This guy took off in that fashion but then abruptly slowed to a crawl with his head hanging over the side. I looked over the side too and realized we were in knee-deep water. Curiously, I looked for the depth sounder but there wasn't one. "Don't you have a depth sounder?" "What for, I was born here." OK, that makes sense. We made it, I paid him twenty-five euros and he spent about 3 euros on gasoline by taking the shortcut. My summer is a mess - well, not really. The boat is anchored in Culatra and I'm back home working on a Sunday...that's messy enough, I'd say. Since I can't spare the time to write a proper post, I'll describe the trip with photographs. This is the leg from Sines to Sagres. The dinghy doesn't look bad in the picture. But I can assure you that in real life it looks like garbage, the deteriorating PVC sticks to pants/shorts and, if that weren't enough, it developed a fast leak in Alvor which I couldn't fix even with three patches. Notice the crusty stainless railing - soon I'll be writing a post about how I polished it to a shiny finish with a few brushstrokes. I'm not kidding. I'm very happy to no longer being doomed to spend many hours rubbing like a slave to achieve mediocre results. The product I used does not deteriorate the stainless alloy, but there's a trick to using it. I tried it last year and failed miserably. Live and learn. My rag-and-polish slavery days are history!! Stay tuned to learn how to polish stainless. Sitting at the bow watching and listening to the hull slice through the water is mesmerizing until your bum gets sore from sitting on the teak railing. My favorite activity while sailing. But I assure you that I sit up and look around whenever I hear a ship rumbling nearby, when I get thirsty or have to pee. Anchorage in Sines. It has a good marina too, but I like anchoring. All the hat-like things along the beach are food and drinks stands and the box-like thing just to the right of the building at the bottom is the bandstand that emitted huge quantities of sonic noise until dawn, every damn night. Saw less dolphins than usual, maybe because I was sailing mostly under 5 knots. The three pods that visited took a liking to the towed dinghy - they must have thought Jakatar was the mother and the dinghy was the baby. Sagres anchorage. I was sailing into the port, turned the engine key and nothing, nada, niente, not even a click. Tacked out of there and anchored in this large open bay. Here's the culprit. A faulty power kill switch. Removed it and made a direct connection. Pretty cool tripod for the camera and camcorder whose legs twist and grasp anything that's graspable. Very reliable. A bargain at 6 euros or so at Lidl. Alvor at low tide. Jakatar is in the background somewhere. Kitesurfing in Alvor. I ran aground pretty hard in the channel when motoring in. The sand shifts from year to year and that's why I always enter or leave on a rising tide. I cranked the wheel away from the bank, kept the engine engaged in forward and the boat eventually pivoted and came free. Maintaining the engine in reverse would have been a mistake because, due to the incoming current and sandbar configuration, it would have kept riding up onto the sandbar. I'd need a diagram to explain it properly. Trust me, I'm an old salt and old salts know everything...even if we're wrong more often than we like to admit. Alvor beach, on the ocean side. It's a fifteen-minute walk from town. I went for a swim and the water was nearly perfect. I ate a banana, raised anchor and then motored out of the Sines anchorage at 5:30 in the morning. Darkness was turning to dusk and an extremely loud rock band was still playing to a thinning crowd on the beachfront. Don't ask me why I stayed two nights in this musical inferno, why I deprived my body of much needed sleep or why I drank copious amounts of wine to help me fall asleep. Sailing past Cabo Espichel on the way to Sines. Genoa only 3/4 unfurled to keep it flat and just short of the spreaders, otherwise it would rub on them. So here I was embarking on what turned out to be a 14-hour sail feeling kind of groggy, but happy to leave a town I really enjoy under normal conditions. I motored out of the large harbor, past some anchored ships all lit up, according to maritime rules, and then got hit by the swell. The last two legs (Peniche to Cascais and Cascais to Sines) had been amazingly smooth, but now I was rolling in the northwesterly waves with absolutely no wind to raise sail and steady the boat. Motored for a few hours, got tired of listening to the Kubota burning up my expensive diesel and then raised all sail - that's three sails and the task takes some effort without self-tailing winches. I have a 44 m2 genoa as heavy as circus tent canvas and I need a winch to unfurl it in light wind. Started out doing about 2.5 kt but didn't care because nobody was waiting for me in Sagres and the boat stopped rolling, almost. There's a minor misadventure to come later in Sagres, but for now enjoy the video. Hey, don't tell my mother I didn't use a harness. At this point the sea was flat, but that's still a poor excuse.